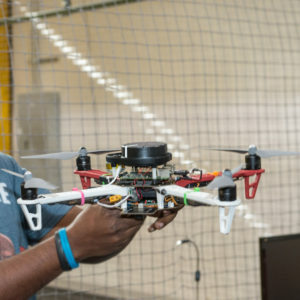 The Unmanned Aerial Vehicle Lab provides complete testing facilities for autonomous guidance, navigation, and control of unmanned aerial vehicles (UAV)s in an indoor environment. The lab is equipped with a sophisticated optical tracking system and decentralized wireless ad hoc network (WANET) for real-time telemetry, making it a state-of-the-art test facility to develop autonomous navigation and control of UAVs using onboard sensors and actuators without external navigation aids like GPS or known beacons. The lab will be used to test both single vehicles and multi-vehicle formation and synchronization maneuvers.